First and foremost, when designing your bandcamp page do not use white text on a foam green background. It makes your lyrics impossible to read. 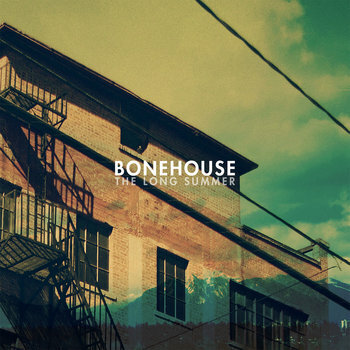 That said, Bonehouse has a definite 90's emo sound to them, moving to the side of the Ethel Messerve/Braid sound but perhaps with a little bit more of an aggressive approach at times (particularly in some of the distorted guitar tones). It can be catchy and interesting; the kind of songs that seem to have a good deal of emotional dynamics to draw you in. The band seems to utilize the group chanting device often. This is used to emphasize particular sections of lyrics, repeated anywhere from 4 to 6 times in a row. Sometimes they create a very nice effect when the lead vocals sprinkle over the top of the chanting. Speaking of the lead vocals. This is probably the most compelling part of the whole thing for me. The vocals come across in a slightly off key, but "still trying to nail it" sort of way that seems to lend itself well to sound very honest and present.